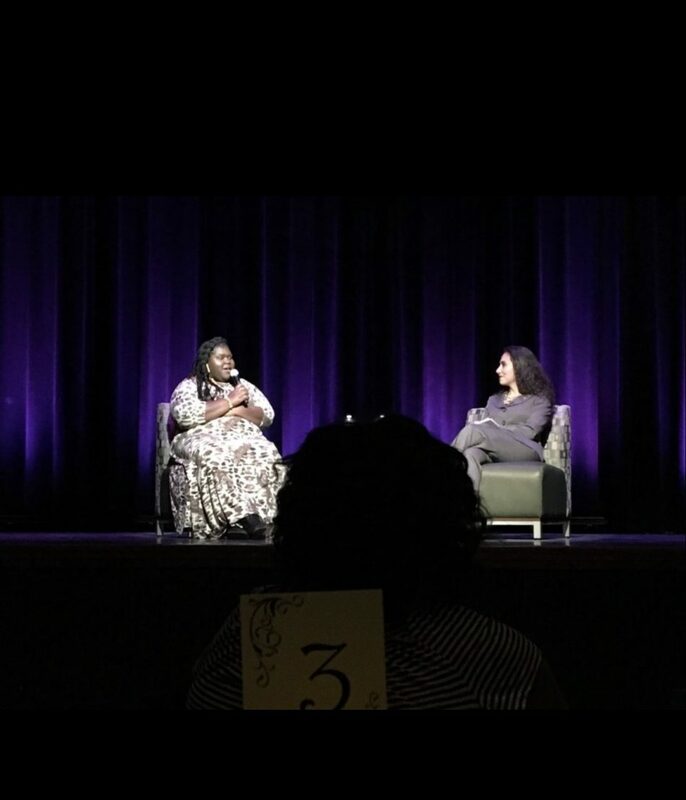 Gabourey Sidibe talks to dinner attendees inside the Brown Ballroom on the campus of ISU, for the 2018 Women’s History Cultural Dinner. (Photo courtesy Joi Adams/WZND). NORMAL – Students, Faculty, Alumni and Guests gathered in the Brown Ballroom on the campus of Illinois State University for the 2018 Women’s History Cultural Dinner. ISU has held Cultural dinners ever since the 1980’s. Putting cultural appreciation in the spotlight – dinners include food, music, and keynote speakers. Campus organizations involved in coordinating these events include ISU Event Management, Dining and Hospitality, Association of Residence Halls, Tri-Towers Area Government, Tri-Towers Diversity Coalition, and MECCPAC-A Dean of Students Diversity Initiative. This years Women’s History Cultural Dinner featured Senegalese-American Actress Gabourey Sidibe as its keynote speaker. Sidibe made her acting debut in the Academy Award-nominated film, Precious: Based on the Novel Push by Sapphire (2007). She received nominations for an Academy Award, Golden Globe Award, SAG Award, Broadcast Film Critics Award, and BAFTA Award for her role in the film. Sidibe gave an inside look into her book, This Is Just My Face: Try Not to Stare, a tell all memoir about her life. Sidibe also gave advice to Women in the audience who deal with self-esteem issues. “This is your body, no one has reign over it the way that you do. Whatever way you figure out how to love yourself and love your body, whatever it is, your opinion needs to be stronger than everybody else’s,” Sidibe shared as encouragement to the audience. Sidibe had laparoscopic bariatric surgery after she was diagnosed with Type 2 diabetes. “There are always going to be opinions no matter what. If I lost 200 pounds, I’d be too skinny. If I didn’t lose it fast enough-there’s always going to be something. As long as I know who I am. I know that I am love and my own self love is more important than anyone else’s,” Sidibe shared in response to her critics. Sidibe discussed how the representation of Women in the Entertainment industry is changing. “It is getting a lot better. You see more women behind the camera, which is great. That means you can see more of our stories in front of the camera,” Sidibe expressed. Sidibe went on to share how while there has been more diverse representation on film, some groups still have yet to be seen. “It’s hard to see yourself in the mirror and know that you are valid. Which is why we need to see ourselves represented in every light. It can’t just be for some, it needs to be for all of us,” Sidibe said. Sidibe also took the time to celebrate the contributions of other influential women, one was signer Nina Simone. “Her message was so strong. She was such a fighter. She cared about the world. I’m so inspired by her everyday,” Sidibe shared. Sidibe directed a short film, The Tale of Four (2016), inspired by Nina Simone’s song, Four Women. “I feel her in the air all the time. She’s such a force that I don’t think death has stopped her,” Sidibe shared. Gabourey Sidibe shared that she will continue her re-occuring role as Becky on the Television Show Empire. Sidibe also shared that she will continue writing stories and hopes to direct a possible documentary about Women in the near future. Joi Adams contributed to this story.